Route 91 Festival survivors band together to go to the Jason Aldean concert Thursday night in Chula Vista, facing their fears for the first time since the Vegas shooting. CHULA VISTA, Calif. — Roughly 150 local survivors of the Las Vegas shooting rampage attended the Jason Aldean concert in Chula Vista Thursday. It was the first time the country music star has performed in San Diego since surviving the deadliest mass shooting committed by one person in the United States. Chula Vista Police said they had been preparing for the event for days. The department said they want to dissuade people who may have bad intentions, as well as make concertgoers feel safe while enjoying the show. 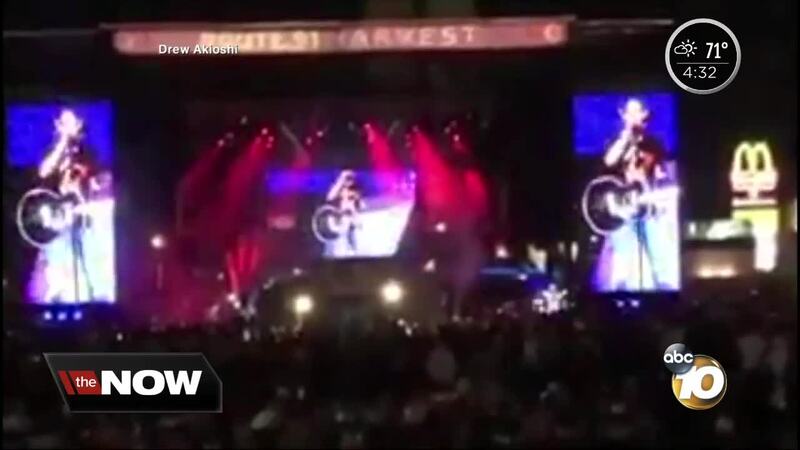 Heather Dumitru was at the Route 91 Harvest Country Music Festival and heard three pops. She thought they were fireworks from a nearby hotel. When she noticed the smell of gunpowder, she dropped to the ground. "At that point, I watched the lady fall next to me... The image that literally haunts me to this day is one of the ones I can’t get out of my head is her dress turning from white to red," she said. She said it was difficult to get out of the venue, the Astroturf was soaked and she kept slipping. She remembers slipping and sliding on the wet turf, with her boyfriend pulling her by the arm to help her escape. Aldean, who was performing when shots rang out in 2017, opened up about the shooting. "I think you go through a lot of different emotions of being thankful that none of your family and friends was injured. And then you feel guilty," Aldean said. "Those people are there to see your show so that's awful." Since the October night, the singer says he’s struggled with the complexity of his feelings about surviving. In total, 58 people died and hundreds more were injured during the mass shooting.